Don’t see the Status Column? 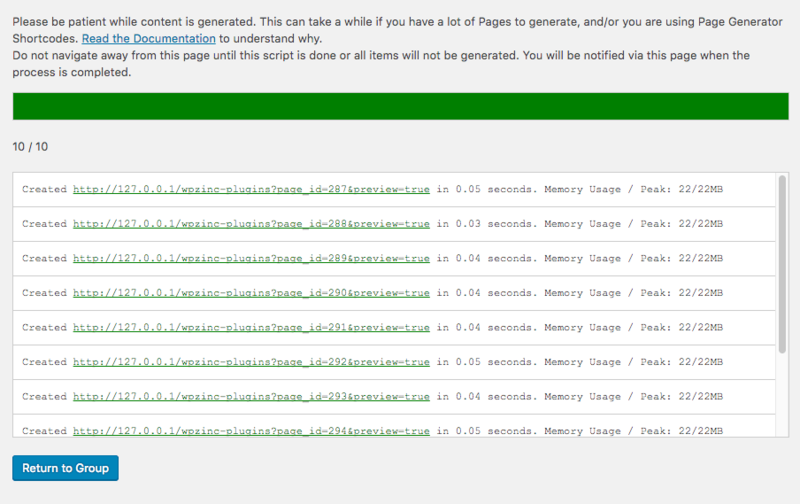 It’s new to Page Generator Pro 1.9.9+. Older versions will have these actions (excluding status) below the Title of the Group in the table. The current status of an action that is being performed, such as content generation. 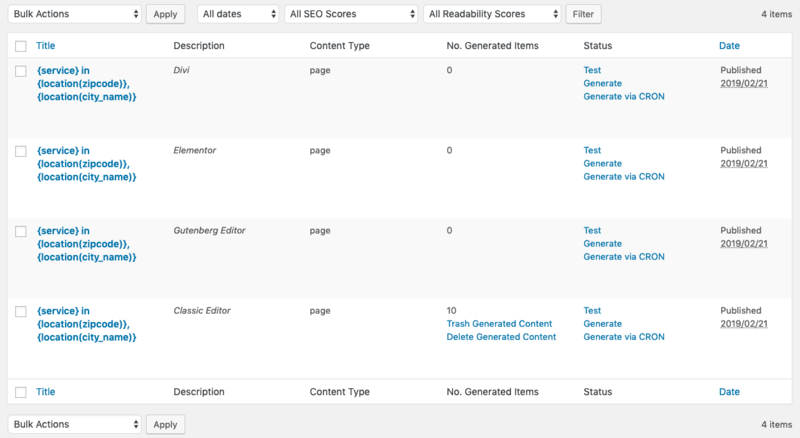 It’s always recommended that you do this before generating all of the content. The Test method generates a single, draft Page, Post or Custom Post Type, with verbose error output if elements fail (for example, a shortcode). Click the preview link to view the test content, where you can confirm correct working functionality, and make changes to your Group as necessary. It’s important not to navigate away from this screen until generation is complete. Navigating away will resut in incomplete content generation. To generate content in the background, consider using the Generate via CRON method below. Need to confirm if WordPress is running the CRON task? Install the Crontrol Plugin, Generate via CRON and check for the page_generator_pro_generate_cron task. If your server / web host provides WP-CLI, you can Test and Generate Content through WP-CLI. Refer to the separate Documentation covering how to use WP-CLI. This will not delete any existing Generated Content. To do this, refer to the rest of the Documentation below. The Generated Items column displays the number of Posts / Pages / CPT’s generated by each Group. This allows you to trash all existing Page(s) that were generated by this Group. This allows you to permanently delete all existing Page(s) that were generated by this Group. This is useful if you made an error, and need to replace your existing Pages with revised content.